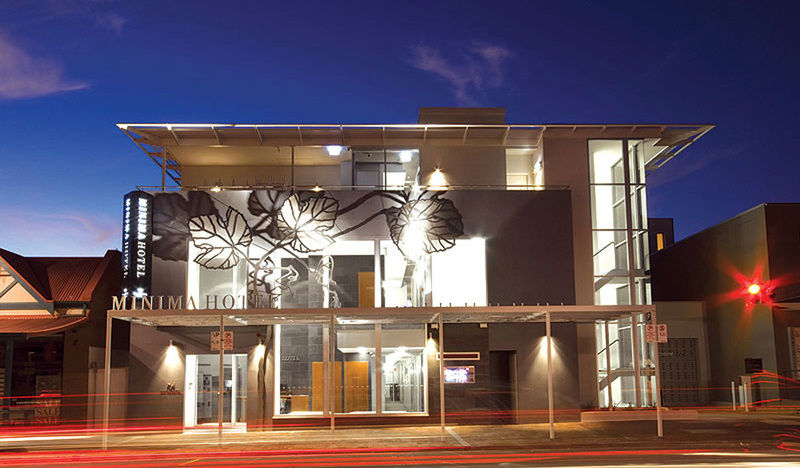 The exterior of Adelaide's Majestic Minima Hotel. 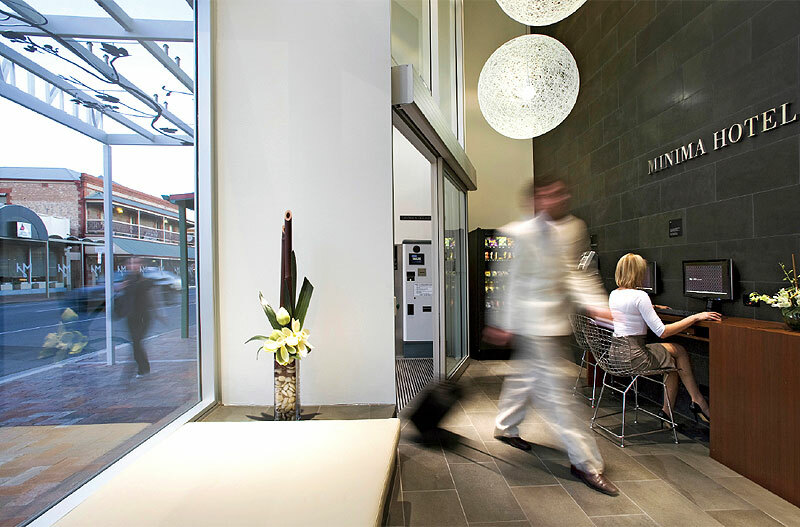 AT has seen the future – and it’s in hotels like Adelaide’s Majestic Minima. But, like many things about the future, there will be those who embrace the new order and those who resist with every fibre of their being. Which kind will you be? When it comes to booking hotel accommodation, there are two different kinds of people. The first group can be heard saying, “Who cares what the hotel is like? As long as it’s clean. I won’t be spending much time in there anyway.” Then there’s the second group. They view staying in a hotel as an experience. In fact, the type of hotel is perhaps the most important part of their holiday. For these people, there’s no bigger turn off than a hotel declaring itself to be “just like home”. They want to sleep on sheets they can’t afford in a bedroom that has leapt from the pages of a glamorous home-decorating magazine. Across one wall was a huge Plasma. In a small room like this, that’s overkill. It looks strange. Like a Hyundai Excel with huge spoilers on the back. Both of these groups make really annoying holiday partners. The people who don’t care about their hotel do care about something else – usually getting up at dawn so they can visit every museum and antique fair within 100km. Their days are packed and there’s no relaxation. After going on one of their holidays, you need . . . well, you need a holiday. So I have a suggestion for this second group of people: Do not stay at the Majestic Minima hotel in Adelaide. Because all you get is a cell. But it is the future. 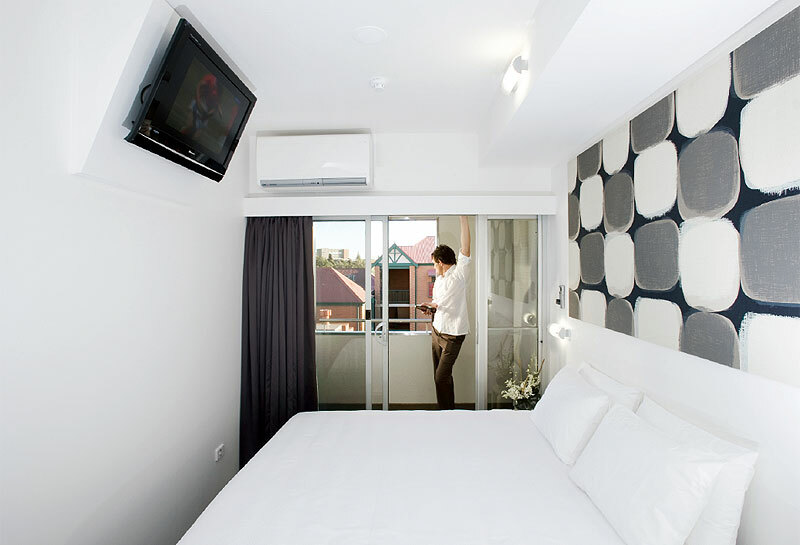 Set on trendy Melbourne Street in North Adelaide, the hotel is more minima than majestic, and is a self-service, no-frills outfit. And when we say self-service, it really is. There are no staff here at Adelaide’s first self check-in hotel. 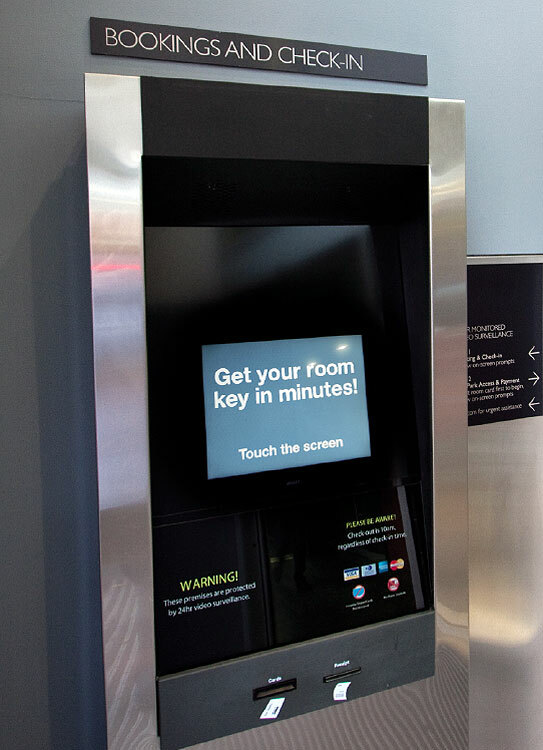 You simply swipe your credit card in an ATM-looking device, which then spits out your room key. That’s it. The foyer is a barren, soulless place, with two internet connected computers and a softly growling vending machine. 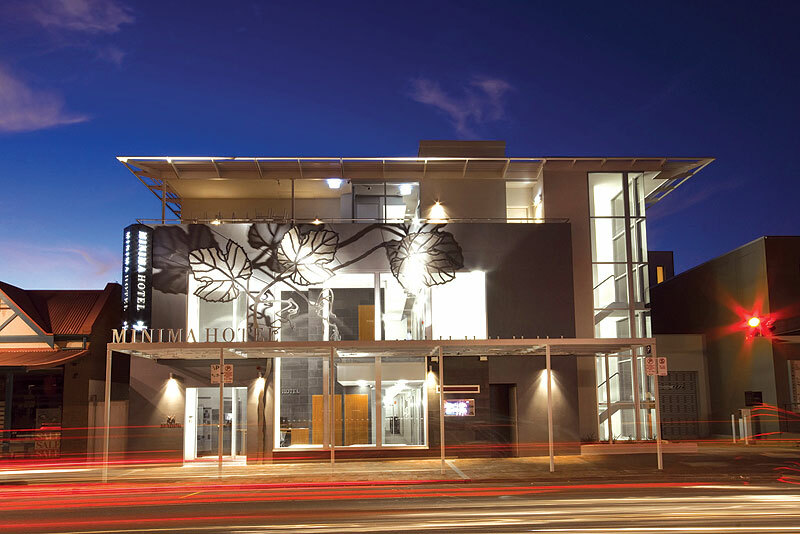 But you get what you pay for – and at the Majestic Minima you don’t pay much. There was a bit of excitement at the AT offices when we were booking in to the Majestic Minima. We were going to experience the future! Like visiting a piece of Japan in Adelaide. Back in the ’80s everyone saw (and scoffed at) Japan’s “sleeping cubicles”, but now here they were on Australian soil! The website even has a video from Getaway showing how fabulous the place is. But let’s face it: everything on Getaway is fabulous. We booked the Majestic Minima online. The AT website and Wotif had the rooms available for $99 a night. However, when we went to the hotel’s own website, they tried to charge us $120 for the same (standard) room. So be warned: check around before booking online. And in the Majestic Minima’s case, their own website will not necessarily be the cheapest. The website also showcases a rooftop terrace, with a group of trendy people appearing to enjoy a glass of Pinot and some delicious Asian food. When we ascended to explore said terrace on a drizzly Wednesday evening, we were greeted by a large wooden table and a roof-mounted security camera watching our every move. It was more than a little disconcerting. But at least you can get out of your room. Which you don’t really need to do. Our tiny little room had a small desk, a balcony, a king-sized bed and a bathroom. This last was a huge improvement on the tiny bathrooms at Melbourne’s Pensione, which are, quite frankly, poor excuses for bathrooms. No, these bathrooms were a manageable size. With no bath (obviously), but a decent shower and a loo you don’t have to ride sidesaddle. Our expectations were low. But they were exceeded. Across one wall of our room was a huge Plasma screen TV. In a small room like this, that’s overkill. It looks strange. Like a Hyundai Excel with huge spoilers on the back. But the TV works, albeit with only a couple of Foxtel channels and some not-so-hot reception of the free-to-air Adelaide programming. Which is another big tick for the Majestic Minima. So, would we recommend the Majestic Minima? Absolutely. For the money, it’s great. 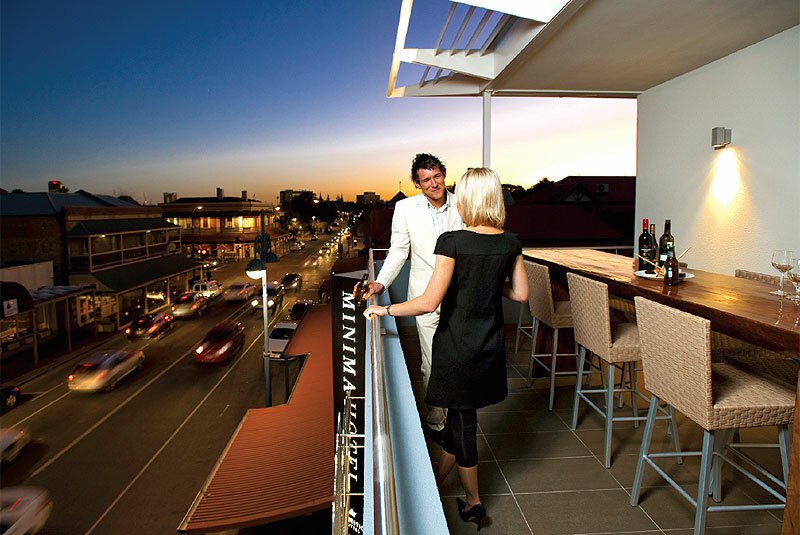 The location is tops, being diagonally opposite the Lion Hotel and its superb pub food, and on a busy strip in Adelaide with lots of things to do so you won’t be stuck in your hotel room. We will stay there again if we visit Adelaide on a budget and “just need a room, as long as it’s clean”. Where // 146 Melbourne St, North Adelaide SA. Notes // AT paid $99 for a standard room. The Majestic Minima’s own website was asking $120, so shop around.